SAND VALLEY, WISCONSIN – When the Scots invented golf more than 500 years ago it was to get outside with your mates, practice your aim and direction for upcoming archery drills and just see how many swigs of whiskey you could get from the bottle you brought with you. (18, if you believe the legend how they came up the number of holes in a complete round). But mainly the game was invented to have fun with friends, in often challenging conditions, but enjoy to challenge the time together and the hole layouts. But over the last century or two, golf has often drifted from fun to struggle to labor or a sweaty effort to just keep up with the ever-increasing length and challenge. Well, the earliest of Scots would indeed enjoy the new Sand Valley Resort in the Central Wisconsin sandy wilderness. Because if asked to describe this new 36-hole facility, with a 17-hole par 3 course, lodging and food, and you weren’t allow to use the word sand, of which there is plenty, the word would be 'fun'. Fun to play, fun to challenge, fun to be with friends and fun to discover that Mike Keiser has not lost his magic golf resort touch which has made Bandon Dunes and Cabot Links on both the Pacific and Atlantic Coasts equally fun. Sand Valley is driveable par 4, pitch and putt, on-course Kielbasa sausage eating, Wisconsin-brewed beer drinking fun, for amateur golfers and all who love getting together with friends, family and fun. Ben Crenshaw and Bill Coore, true lovers of fun, links golf, opened the first course at Sand Valley in May of 2017 and it was quickly named the best new public course in the U.S. by Golf Digest Magazine. 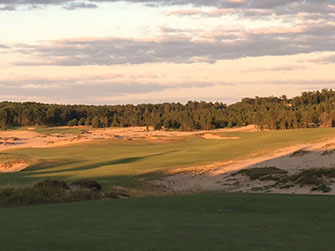 The 17-hole Sand Box Par 3 course, another fun short game tribute also designed by Crenshaw and Coore came next, and in May of this year Scotsman David McLay Kidd opened the Mammoth Dunes course at the resort. Now it is the hottest new resort in the U.S., within easy driving distance of much of the Midwest, built by the same developer who did two other smash hit public resorts, using the same architects. 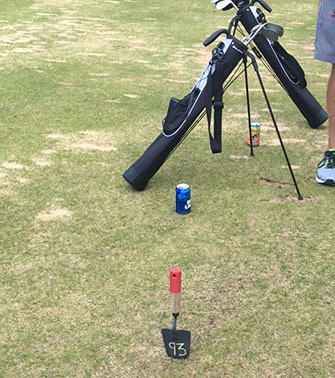 The golf is in full swing and the good, fun times are just beginning. It’s always a matter of personal option which of the two courses is better. Both use the same hilly, sandy landscape. 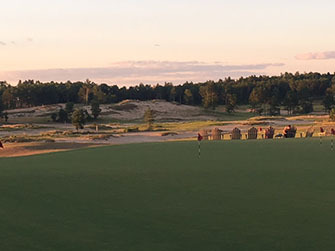 Sand Valley is newer, with faster greens, more grown into the surroundings, but judging on the fun factor only, Mammoth Dunes is the clear early winner. This is because Keiser and Kidd have built a course not to host a U.S. Open or challenge the best players in the world, (Dustin Johnson and friends might laugh at the wide fairways and short distances) but to provide maximum fun (there’s that word again) for all who play there. The course boasts wide sloping greens forcing players to aim totally away from the hole at times to be able to roll it back close to the pin placement. There is little on-course water on either of the two courses, but wide expanses of sand to hit over and wide canyon gaps on several of the par 3s, notably the 16th at Mammoth Dunes. The course name itself comes from several of the greens which look like wholly Mammoth elephants where buried underneath. Perhaps bad for the single figure purist looking to win golf’s national championship, but perfect for a foursome looking for maximum enjoyment. The hole you’ll go home talking about here is the par-4 14th which tees off from a huge vista overlooking the entire property and slopes hugely downhill with the green protected by large mounds on the right side of the putting surface. At only 318 yards from the very back tees and considerably shorter for most golfers, it’s set up to be driveable for many players and gives you a rare chance of putting for eagle. On those sloping greens, good luck, but still a fun and potentially confidence-inducing experience. Mammoth Dunes is a rare par 73 course, but with five par 5s, there is a chance to be putting for eagle or birdie on several of the longer holes depending on the many combinations of tees you choose. Sand Valley is par 72, but with a unique 35-37 combination including 5 par 3s and 5 par 5s. The Sand Box Par 3 is a 17 hole (why 17?, just to be fun and different) short hole challenge with moist of the holes less than 100 yards and only 3-4 clubs maximum needed. In fact the resort offers small quiver golf bags to each guest, just large enough to carry your clubs and a sleeve of balls for your Sand Box round. The final par 3 hole plays alongside the Fairway lodging, meaning you can step from your room onto the 17th ‘fairway,’ and watch fellow golfers or practice a few chip shots or putts yourself. The drink station is contained in a huge metal canoe, which looks like it’s served duty in a summer camp before, completely filled with ice and loaded with all kinds or beverages and snacks. Back at the wooden planked clubhouse, there are lots more local foods and drink, including the Wisconsin Walleye, the massive Sand Valley Burger and homemade ice cream sandwiches, with flat screens TVs everywhere you look to watch golfers who likely aren’t having as much fun as you are right now. For a state the size of Wisconsin there is a tremendous public golf resort variety here. Erin Hills, which hosted the 2017 US Open, is about two hours east, closer to Milwaukee, and offers a tremendous 72 hole challenge with wide fairways, hilly terrain and stellar on-site lodging with a huge fire pit to celebrate your good fortune. Whistling Straits, an hour north, has four fantastic public courses, including The Straits, host of the 2020 Ryder Cup. Around here fun is the new F word and is thankfully spoken in wide circulation.